The BRIESE CINEMA electronic ballast offers automatic voltage selection from 90 to 260 V and works anywhere in the world. Operation at 220 V to 240 V, single phase, requires an outlet supplied by a 16A circuit. Two 15A phases are needed for 90 V to 120 V operation. The Cinema 4 is a combined ballast that runs 1200W, 2500W or 4000W. It is available with 300Hz or 1000Hz. The functional interaction with our reflectors results in work on highest technical niveau. Available Light carries both the 300Hz and 1000Hz (high speed) CINEMA 4 ballasts. 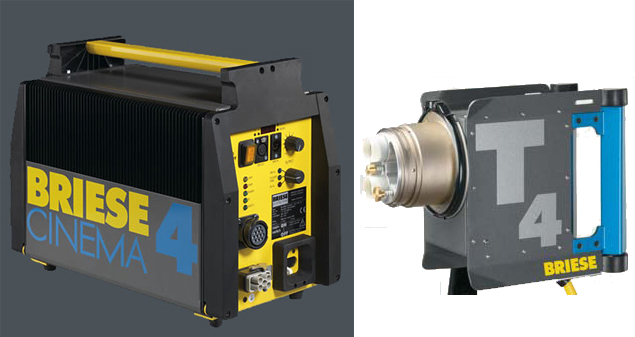 The T4’s can be bulbed with 1.2K, 2.4K or 4K HMI lamps.